Since my daughter has been sick the last few weeks, I admit I fell off the organizing bandwagon. This week's Mission Organization project is an ongoing project. Taking control of the dreaded paper clutter! 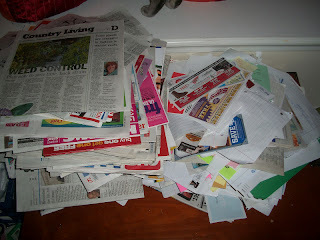 You might not realize how much excess paper we really do accumulate, especially when you don't keep on top of it like me. I subscribe to two newspapers. I do have good reasons for two. One is my local paper, and the other is the Detroit Free Press which is less and an hour away. I use the weekly coupon inserts, and I also write articles for Examiner.com as the Frugal Family Examiner for my area. I need to keep up with all the area activities. Newspapers pile up real fast, especially when I do not always get the chance to look at them daily. A lot of my paper clutter is from the schools. I have 3 kids, and because of what grades they are in, they also go to 3 different schools. Paper from the schools has diminished some due to newsletters being emailed etc.., but I still find a lot in my kid's backpacks. 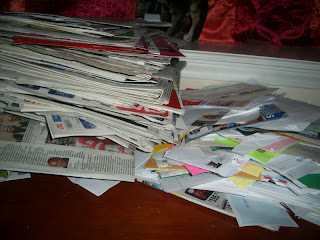 Junk mail, envelopes, bill inserts etc.. also really add up daily. There is one good thing about accumulating all of this paper clutter. Our local schools have paper recycling bins where all of our unwanted paper earns money for our local schools. Looks like I need to make a drop off very soon! Properly dealing with paper clutter will ensure that our homes are well-organized. These tips that you have provided in doing so are indeed very helpful. Bringing our paper clutter to shredding San Antonio (for example) is another effective way of de-cluttering. Thanks for sharing.